To celebrate our 30th Anniversary year we are holding coffee mornings on the second Monday of each month. Join us between 10am-1pm for a chat and enjoy refreshments and take a look around our wonderful facilities. 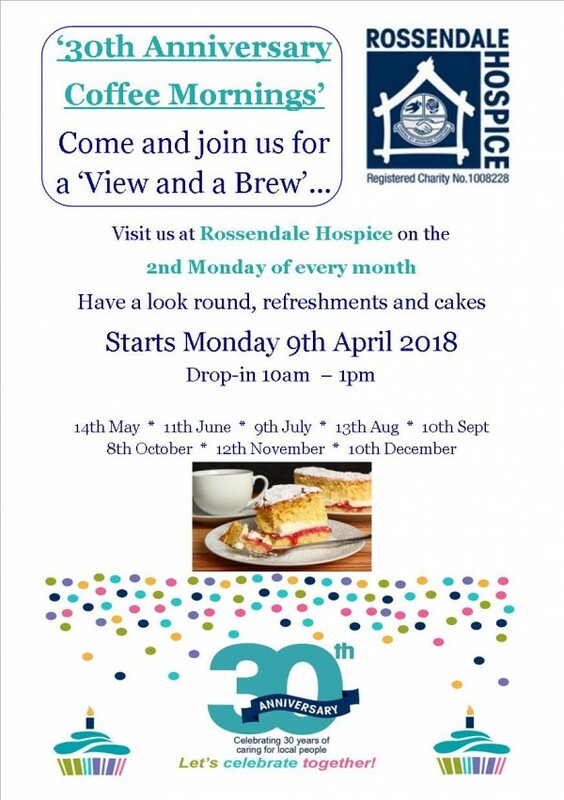 For the last three decades, Rossendale Hospice has been providing care and support to local people living with life limiting illnesses. It has delivered valuable support to thousands of patients and carers in the valley since it opened in 1987. Originally set up to help cancer patients, the hospice has developed over the last 30 years and now supports patients with other illnesses such as MS, dementia and lung & heart conditions. The Hospice was founded by Dorothy Mitchell and a group of likeminded individuals within the Valley, whose aim was to stop dying being the loneliest experience of life. This vision was built upon, which is now a highly valued service in Rossendale.